Lots of ink gets spilled about what a terrible job the Fed is doing, or how the BoE ought to have done more QE – i have spilled ink in both causes – however too little criticism is directed toward the RBNZ. 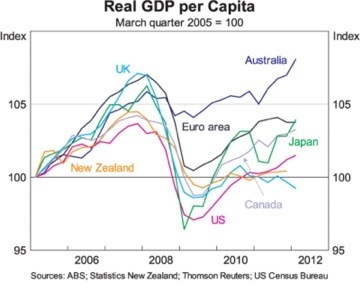 NZ GDP per capita has recovered only ~1% from the recession low, and it remains about 4% from the prior peak. The unemployment rate shows no signs of declining from ~6.5% and inflation looks more likely to drop below 1% than exceed 3%. This is a disaster. Bollard ought to be ashamed. I think i am the only person in the market who believes that they will cut this week (-25bps to 2.25%). If they do not ease, they certainly will be more dovish.